Of the four men currently dominating the ICC batting rankings, Kane Williamson is the least conspicuous. The jerky, fidgety Steve Smith accumulates runs with robotic relentlessness, Virat Kohli bristles with impetuousness at the crease, Joe Root is balletic in his movements. Williamson is more poised than Smith, less frenetic than Kohli, more precise than Root. There is a scientific essence about his batting: he is the ultimate technician. He is studious in defence, methodical in attack. His shots are mainly old school featuring sound footwork and neat execution. He got off the mark yesterday – from his 12th ball – with a perfectly-timed steer through extra cover for four. It did not cannon into the fence. It teased the fielder all the way and hopped tauntingly over the rope. There is little flourish in his strokeplay, extravagances are rare. His bat is not a weapon but an instrument, creating angles to guide the ball into spaces. He is often compared to New Zealand’s batting maestro Martin Crowe (and will overtake Crowe’s New Zealand record tally of 17 Test hundreds if he converts this innings to three figures.) Crowe was more of a stylist, but in one aspect they are identical – the ability to block the ball dead in defence, denying the bowler even the merest hope of a wicket and often creating the opportunity for quick singles. Crowe did this by playing the ball almost daringly late. He was infuriating to bowl at. Your best delivery, quickish, on off stump moving away slightly, was stunned at his feet, and off he would scoot for an unstoppable run. Williamson, who adheres to the old batting rule – move early, play late – adds to that formula a bat angled at 45 degrees. He cushions the ball directly under his eyeline. It trickles out on the offside or all along the ground to third slip. This ‘soft block’ was a vital asset to snuff out any impending danger after New Zealand lost an early wicket to the new ball. Several searching deliveries from Jimmy Anderson were deftly repelled or watched forensically all the way through to Jonny Bairstow trying to pick up the maximum information about speed, bounce and trajectory. If Anderson went slightly wider of the crease, he shuffled across outside off-stump to counter the change of angle and seek a single on the legside. When Anderson sought a fuller length, Williamson moved clinically onto the front foot and leaned on the ball through cover. Anderson, the precision engineer, had met his match. His serene, secure approach was the ultimate contrast to England’s inept performance with the bat as a sequence of players remained rooted in the crease and poked hopefully out infront of themselves at the moving ball. Where there was naive inflexibility in England’s batting there was smart certainty in Williamson’s. Recognising his impregnability, the bowlers tried to get under his skin, glaring and chuntering at him and flicking the ball at the stumps. Williamson remained impervious, tending instead to the surface, smoothing out any perceived imperfections. He is passive at the crease, gives the bowlers nothing to focus on or get riled about. 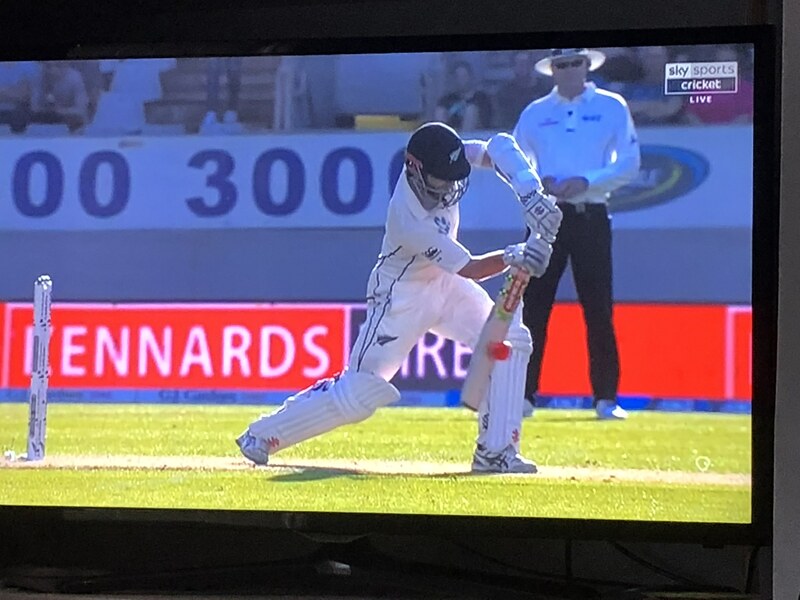 Acutely aware of Eden Park’s unusual geometry, he sauntered out to Moeen Ali and planted him for six to the short straight boundary and rifled another drive back past him. In Moeen’s next over he unfurled a dinky sweep which sent the ball behind the keeper for four. This was calculated, risk-free cricket. Anderson returned and, after one probing maiden, dropped fractionally short and was force-steered square on the offside for four, Williamson rocking back and momentarily airborne to get on top of the bounce. It induced Anderson to marginally over-pitch. Williamson pounced in anticipation, striding forward to caress the ball wide of mid-off and gently, but decisively for four. When Craig Overton banged one in he was back-cut to the boundary. The bat is either perfectly vertical or exactly horizontal. There is no vague half-way house. On 46 he drove at a rare full delivery from Overton – without quite transferring his weight – and sliced the ball for four wide of slip to go to 50. It was his first false stroke in 78 deliveries faced. After the same number of balls England were 23-7. Says it all really.